At Salt, we’re known for great design – usually the end product is an A4 Report, brochure, business card, poster or pull-up banner. 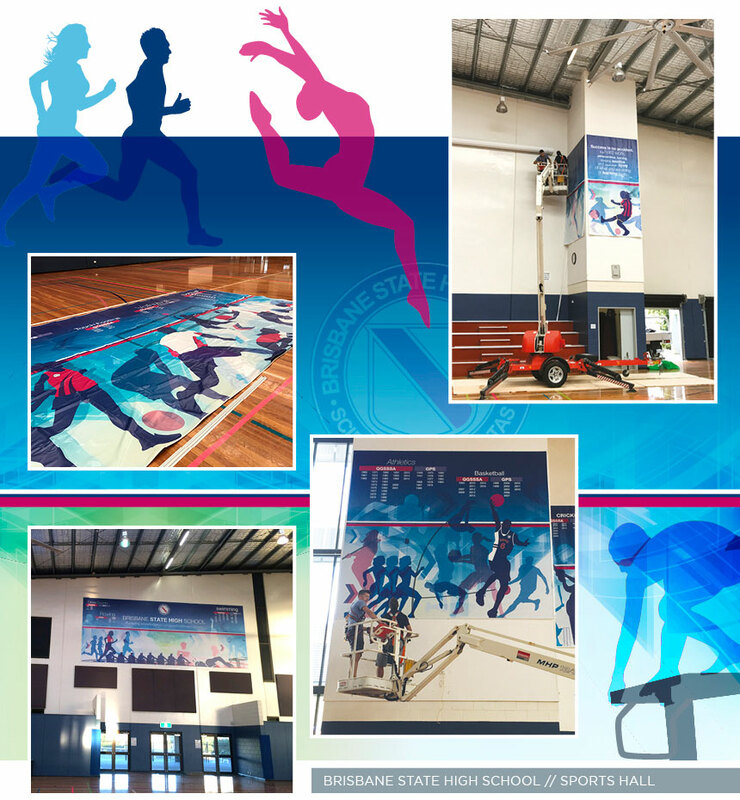 So how excited were we when approached to design, print and install two HUGE murals in one of Brisbane State High School’s (BSHS) Sports Stadiums. What an amazing opportunity to show how design at any scale can inspire, engage and solve even the most challenging of briefs! When first contacted, the brief was to design 26 x individual banners to be installed into a VERY large sports arena. However at the site inspection we quickly realised the walls of the stadium were already jammed-packed with ‘visual noise’ – acoustic panelling, basketball hoops, air vents, steel girders, loudspeakers, glass panels. The last thing these walls needed was even more stuff!!! Instead, we proposed to design and create two eyecatching murals (one for either end of the stadium) which would draw everyone’s focus to the designs. The purpose of the banners from the original brief were to display and celebrate the School’s brilliant sporting achievements spanning over 94 years (1922-2016). Each premiership year in each sport (26 sports in total) was to be represented. Just how that could be done in a logical, eye-catching manner was a challenge in design planning. The requirement for the murals is that they can be added to at the end of each year. Sports who have won their annual premiership will have the year added to their sport’s ‘honour roll’. Our design enables white vinyl cut lettering to be applied – with ample space for the School’s anticipated sporting excellence to continue in every sport for many years to come! Due to the potential limitations of using actual photographs within the design, our client requested that we find an alternative means by which to represent each sport. Planning for the longevity of the artworks (envisaging issues such as changes to uniforms, student privacy and potential copyright ownership of photographic images) lead us to opting for developing silhouette illustrations for each sport – some of which we added the School’s actual sporting uniform to provide even stronger visual links to BSHS. Our design was based on a ‘layered’ image approach using the School’s corporate colour palette. Having already worked with the school, we understood their strong drive to encourange and empower students. So we added another ‘layer’ to the design by including motivational quotes which adds a sense of celebration of achievements and recognition that it is not about winning – but doing your best. Timing for the production and installation of the murals was critical – the murals needed to be installed before the first day of school! We received final artwork approval two days before Christmas! Printing and planning for the installation took place during the first and second weeks of January. The siren may have sounded – but the games have only just begun! We are so pleased with the result! And even better is that our client is too! There is now a strong point of visual focus within the stadium – which reinforces the School’s visual brand and it’s vision for the School, its students and the entire school community. Perhaps, as the clock counts down the last seconds of the next nail-biting game – it provides some winning motivation!